This Chorizo Chili is not your traditional chili. 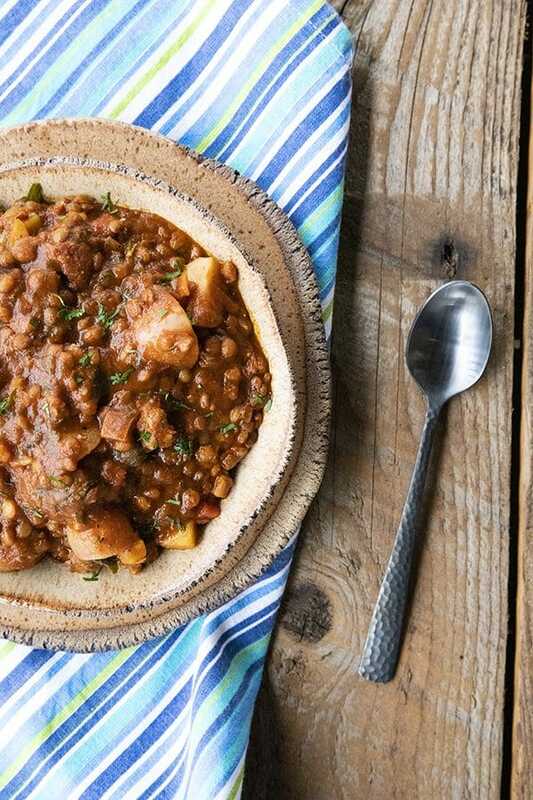 It may be different, but this soul-warming chili of browned chorizo, tender potatoes, carrots, and lentils in this smoky tomato sauce is destined to become a new favourite for you and yours like it did for us. A while back, the flu made its nasty way through our house. While we were lucky and all recovered from the worst of it pretty quickly, everyone felt a little depleted and low energy afterward. My youngest son’s ballet teacher, Sergio Neglia, suggested we try making a stew his mother had made him when he was a boy in Argentina. He said it was simple but hearty; chorizo, potatoes, lentils, onions, garlic, spices, tomato, and other odds and ends. Since the weather has been dreary lately, I had a go at making Sergio’s mom’s stew with some very happy results. Our resulting stew was hearty, comforting, and delicious as promised. We tucked into the hearty, spicy chorizo, tender potatoes, carrots, and lentils in this smoky tomato sauce so enthusiastically that we finished the whole pot in one day. I was a little sad, because I really looked forward to Chorizo Chili leftovers. Yes, this chili recipe makes quite a lot. Thankfully -as with most chilis- our chorizo chili tastes even better a day or two after it was made, so eating leftovers is a treat! What Makes a Stew a Chili or a Chili a Stew? Now wait, did you notice I called it Chorizo Chili instead of Chorizo Stew? While we all agreed that it was delicious the naming caused a debate. Was it stew? Was it chili? To simplify: Stew is slow-simmered in thickened liquid that isn’t drained before serving. Chili is usually a meat in a slow-simmered tomato based sauce with some element of spicy heat. In other words, a chili is a stew, but a stew isn’t necessarily a chili. It’s like all squares are technically rectangles, but the reverse is not true. 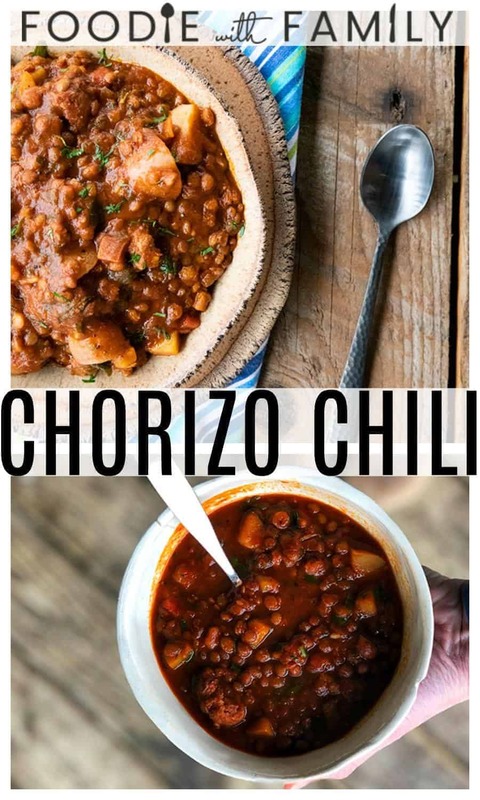 In other other words, a chili is a spicy stew, and that is exactly what our Chorizo Chili was. 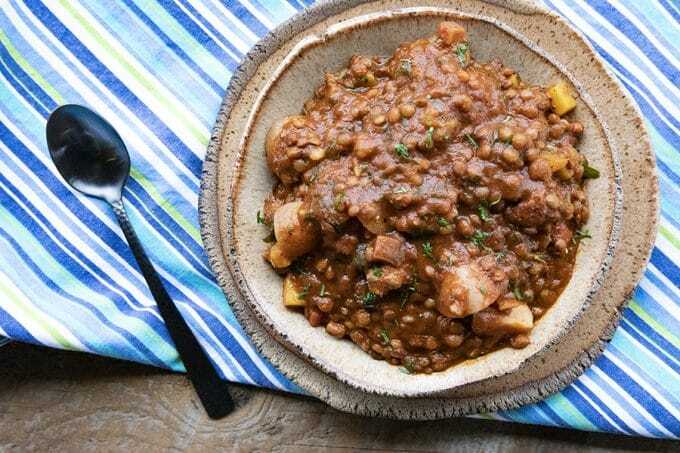 Granted, it wasn’t what we usually call chili in North America, but it was a hearty, spicy, slow-simmered chorizo in smoky tomato sauce with tender potatoes, carrots, and lentils. Yes, lentils. This is another reason we had the stew vs. chili debate. 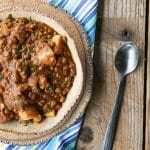 Lentils in chili are generally the purview of vegetarians. 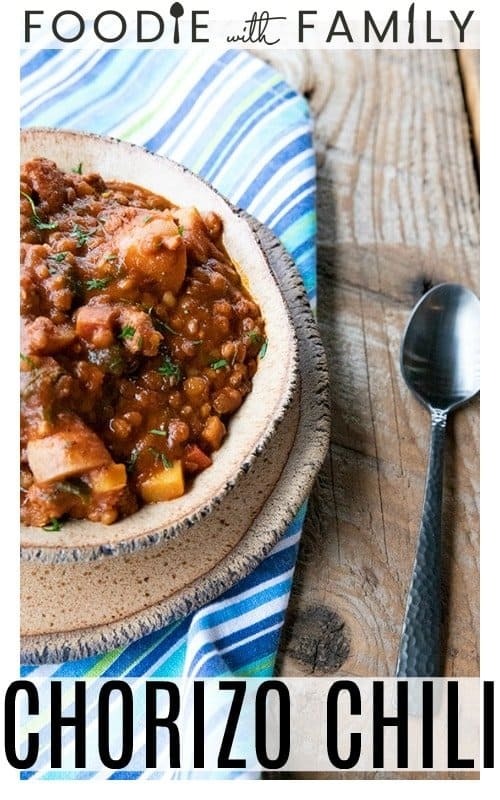 I mean, so is lentil stew, usually, unless we’re talking about my lentil stew which is packed with ham. …What can I say? I don’t like food rules. 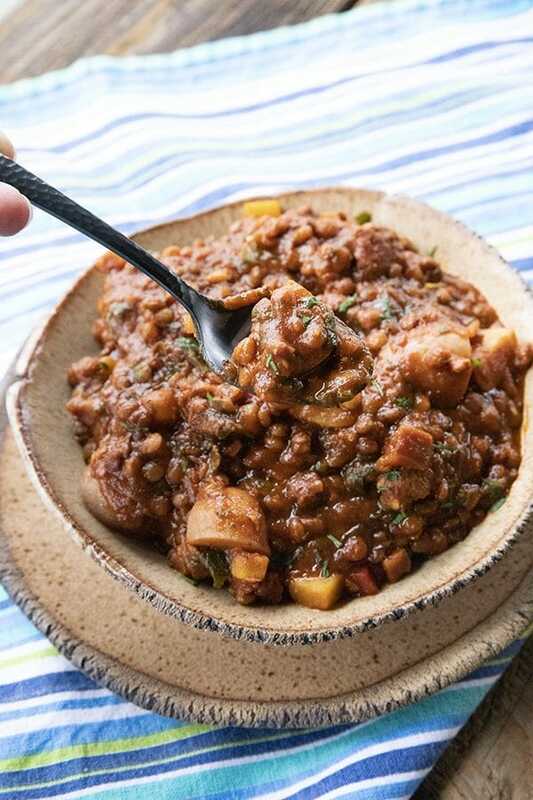 The lentils in this chorizo chili -along with the potatoes- add some thickening power and extra heartiness. My preference is for French lentils (also known as Puy Lentils) because they’re tiny, always cook up tender, and I just plain like them better. I love that French lentils cook to tender in the same amount of time as the potatoes and the carrots in our chorizo chili. Because they’re thicker skinned than “common”, larger lentils, they hold their shape better during the cooking process and don’t fall apart. Mushy lentils are not my favourite. In fact, I have a little theory that mushy lentils are why a great many people think they dislike lentils. In our Chorizo Chili, though, lentils add texture, thickness, and the bean element that is found in more typical chilis. Beans and lentils are related, after all, both being part of the pulse family. You can find French Lentils or Puy Lentils in more well stocked grocery stores, often in the health food section. If you don’t have a Wegman’s or Whole Foods nearby, you can order them easily from Amazon.com. Now that you know what kind of chorizo to use, let’s look at the other ingredients. Some of them are harder to find in small towns but can be mail ordered or substituted easily. You can make this chorizo chili using canned tomato puree or substitute canned diced tomatoes for more texture. I specify tomato paste in the recipe, but if you have Best Thing Tomatoes on hand, they’re better by far! Smoked paprika lends a little Spanish flair to the chili, but can be replaced with regular hot or sweet paprika if you can’t find it. I order mine through Amazon. I like to use fresh thyme tied into a bundle for easier retrieval after simmering, but dried thyme is also quite good in the chili. The recipe gives a substitute amount if you prefer to use dried thyme. If you can’t lay your hands on the abundant fresh herbs called for at the end of the recipe, don’t fret. While they add a lovely burst of freshness as a counterpoint to the smoky, spicy chorizo chili, they’re not strictly necessary. A good substitute for the fresh herbs if you still want that fresh green burst would be chopped green onions. You can use the thinly sliced green parts of about 6 to 8 green onions if you decide to go this route. What kind of chorizo should I use for chorizo chili? This is where we run into some confusion. There are a couple of types of sausage commonly known as chorizo. Mexican Chorizo is the most commonly found variety of chorizo in North America. You can find it in both bulk sausage and link styles in refrigerated meat cases in grocery stores. It is most often a super flavourful, fatty sausage made of ground pork, garlic, onion, chile peppers, and other various spices and seasonings. I have a great recipe for homemade chorizo here. Mexican chorizo gets its deep red colour and depth of spice from the dried chiles that are rehydrated and pureed. It is usually spicy. 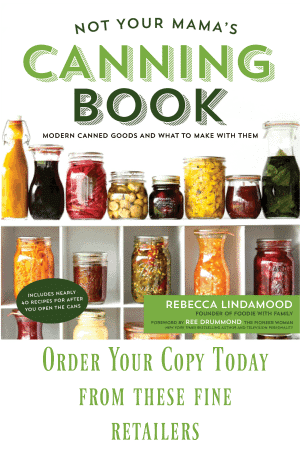 Even when sold in links, it is most often removed from the links and broken up while being browned. Because it is raw meat, Mexican chorizo must be cooked before you can eat it. It is common to see browned Mexican chorizo served with or in eggs for hearty breakfast dishes like breakfast burritos, Huevos Rancheros, Migas, or Chilaquiles. It’s also fantastic in tacos or on salads. Spanish Chorizo, on the other hand, is usually a fully-cooked, dried and cured sausage found near salami and other ready-to-eat meats in grocery stores. It comes in either smoked or unsmoked varieties. Spanish Chorizo is made from chopped pork and pork fat and visually resembles a good salami. It is very flavourful, but there is a little more variety in the level of spiciness. Some Spanish chorizo is mild and others are pretty spicy, but all of them get their bright red colour from smoked paprika, which is a defining flavour of the sausage. They tend to be chewy and dense. It is fairly common to see Spanish chorizo served in slices with tapas. It is equally often added as a flavouring component to soups to add richness and depth. Argentinian Chorizo is sort of a happy mixture of Mexican Chorizo and Spanish Chorizo. 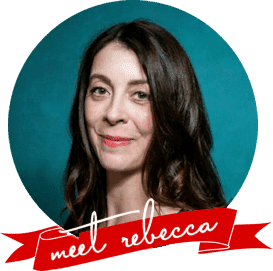 It tends to be a little closer to what we think of as Italian sausage but with red wine, paprika, garlic, and other herbs. Argentinian Chorizo is also a fresh or raw sausage and must be cooked before being eaten. For our chorizo chili, I decided to sub Mexican chorizo in for the Argentinian chorizo I’m sure Sergio’s mother used. I couldn’t find Argentinian chorizo, and I know my kids like the Mexican variety, so the change suited us. The homemade chorizo I used wasn’t melt-your-face spicy, so it played quite nicely with the potatoes, lentils, and carrots. That said, if you can find Argentinian chorizo, I would love to know what you think of it in our Chorizo chili! What kind of pot do I need to make chili? I use an 8 quart soup pot for my chorizo chili. It is heavy-bottomed to eliminate hot spots and has plenty of room to hold my bubbling chili as it slowly simmers. My personal preference for a chili pot or soup pot is stainless steel. It holds and distributes heat evenly and doesn’t stain or discolour no matter what I simmer in it. I don’t like to subject my cast-iron to long simmering, tomato based sauces for that long because I find it damages the non-stick qualities I worked so hard to get with proper seasoning. Likewise, I don’t use non-stick coated pans because they get discoloured or retain smells or flavours when I simmer something so bold in it for so long. -Place a large, heavy-bottomed soup pot over MEDIUM HIGH heat. If the sausage is in casings, remove the casings and break up the sausage into the pan. Continue to break it up into bite sized pieces as you brown it. -When the chorizo is browned and cooked through, about 6 minutes, use a slotted spoon to transfer the meat to a paper towel lined plate, leaving most of the fat in the pan. Add the onions, carrots, and salt to the fat, toss to coat, and drop the heat to LOW. -Cook, stirring occasionally, until crisp tender, about 6 to 8 minutes. Do not brown the carrots and onions. -Stir in the garlic until fragrant, about 1 minute. Sprinkle the smoked paprika and cumin over the vegetables and stir for 30 seconds, or until fragrant. -Pour in the wine, stir well, and let it cook for about 1 minute. -Stir in the remaining ingredients and raise the heat to MEDIUM HIGH just long enough to bring the soup to a boil. Drop the heat again to LOW and simmer, uncovered, until the lentils and potatoes are tender, about 40 minutes. -Remove the pan from the heat and remove and discard the bay leaves and bundle of thyme. if you used it. -If using the parsley and cilantro, stir them in. -Serve immediately or store leftovers, tightly covered in the refrigerator for up to 4 days or in the freezer for up to 6 months. 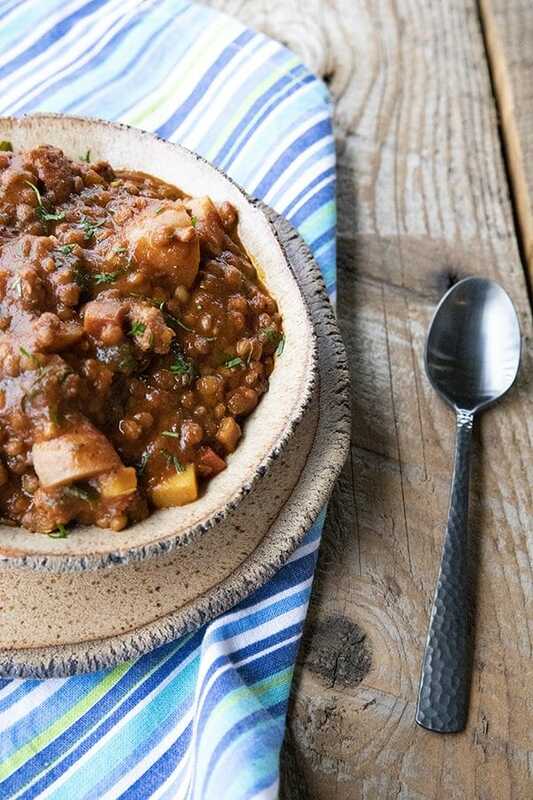 Chorizo Chili is hearty, spicy, slow-simmered chorizo in smoky tomato sauce with tender potatoes, carrots, and lentils. This is serious comfort food! 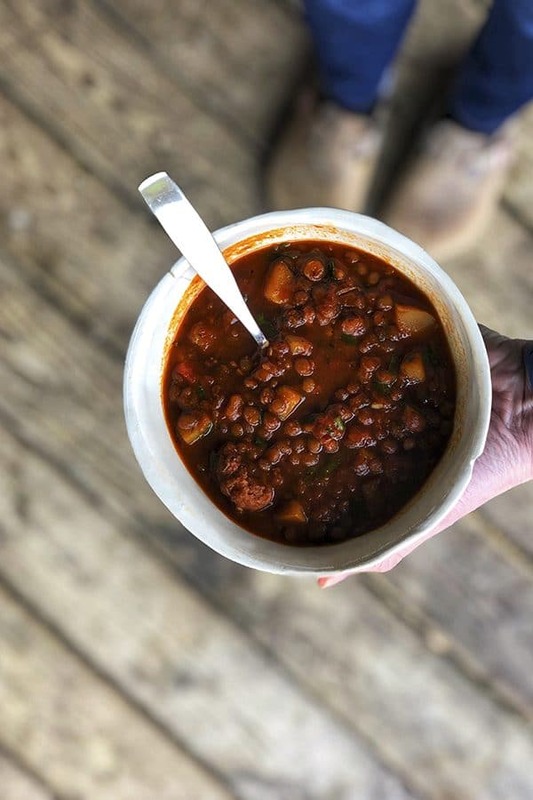 And while this Chorizo Chili is not your traditional chili and it's different, this soul-warming chili is destined to become a new favourite for you and yours like it did for us. Place a large, heavy-bottomed soup pot over MEDIUM HIGH heat. If the sausage is in casings, remove the casings and break up the sausage into the pan. Continue to break it up into bite sized pieces as you brown it. When the chorizo is browned and cooked through, about 6 minutes, use a slotted spoon to transfer the meat to a paper towel lined plate, leaving most of the fat in the pan. Add the onions, carrots, and salt to the fat, toss to coat, and drop the heat to LOW. Cook, stirring occasionally, until crisp tender, about 6 to 8 minutes. Do not brown the carrots and onions. Stir in the garlic until fragrant, about 1 minute. Sprinkle the smoked paprika and cumin over the vegetables and stir for 30 seconds, or until fragrant. Pour in the wine, stir well, and let it cook for about 1 minute. Stir in the remaining ingredients and raise the heat to MEDIUM HIGH just long enough to bring the soup to a boil. Drop the heat again to LOW and simmer, uncovered, until the lentils and potatoes are tender, about 40 minutes. Remove the pan from the heat and remove and discard the bay leaves and bundle of thyme. if you used it. If using the fresh parsley and cilantro, stir them in. Serve immediately or store leftovers, tightly covered in the refrigerator for up to 4 days or in the freezer for up to 6 months. 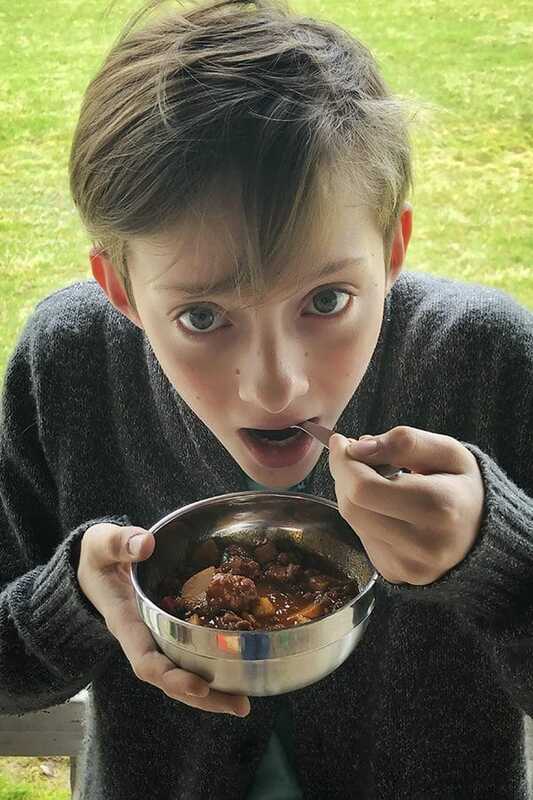 Your chorizo chili eating model is adorable.